Peterborough rugby is on the crest of a wave at the moment with both city sides flying high in the English Clubs Championship. The Lions have lost only once in 10 National League Division Three fixtures while Borough have only been beaten once all season - on the opening day - in Midlands East Division Two (South). The Borough boys keep on celebrating. Lions are fifth in the table while Borough are sitting pretty at the head of their division with a 13-point advantage over their closest rivals. 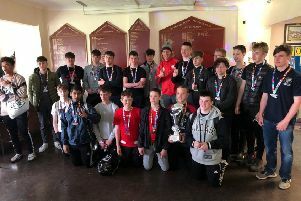 There was elation in both camps last weekend as the two sides celebrated handsome victories and the superlatives were quick to roll off the tongue. “Absolutely magnificent. One of our finest performances so far,” screamed Lions chairman Andy Moore after a 34-8 win at Old Halesonians in Stourbridge. “We were absolutely superb. Top dollar! A wonderful win,” yelled Borough vice-chairman Archie Bennett following a 41-18 victory in a first versus second clash at Old Laurentians near Rugby. Both wins came on the back of outstanding second-half displays. At Old Halesonians it was 8-8 at the break while Borough were leading just 17-11 at half-time in their match. But in the second half it was one-way traffic for the Peterborough sides. The Lions try-scorers were Ben Howard (2), Will Carrington, Chris Humphrey and Alex Iannou while Joe Andresen (2), Tom Williams, Nico Steenkamp and Danius Tomoliunas crossed for Borough. The Lions are away again this weekend and will be looking to do the double over Towcestrians, who they beat 37-24 at Bretton Park back in October. Borough, who are holding a sponsors pre-match luncheon this Saturday, will also be hoping to complete the double over Olney at Fengate (2.15pm kick-off). It was 49-15 to Borough in Buckinghamside earlier in the campaign. Looking back to last Saturday, Borough head coach Lee Adamson said: “It was a good all-round performance and we are certainly enjoying ourselves at the moment. And at our level that is what our rugby is all about. “We train hard as a group and the boys look after themselves individually as well. Put that together with a strong, organised work ethic, and you start to get a group of players who are comfortable on the pitch and who function well together as a unit. Borough will be under no illusions about the task they have in front of them on Saturday. Olney are an improving side who sit fifth in the table and have not lost in the league since November. “We are aware of the danger that Olney will pose for us,” said Bennett. “They have a big set of forwards and some dangerous backs who put us under pressure last time we met them. “Obviously we’ll be wanting to put on a good show for our many sponsors who will be in the crowd, and a win will be a great achievement to round off a joyful January. Borough have no new injury worries and selection of the final squad will be made tonight (Thursday) after training. Olney were 26-19 winners over Oundle last Saturday. Oundle remain third in the table.